RESERVATIONS ACCEPTED: Yes, through ReserveAmerica. 800-664-7787. Of the 44 sites only 7 are reservable. About 17 have water and 30 amp electrical hookups and no hookups for the remaining sites, except the handicap site which has 50 amp service. GPS: N 32.74804, W 105.91454 This marks the park office. This is Charlene in her tilty space. I could not get level in space 5 at Oliver Lee. The second day space 8 opened up which is much less tilty and we moved over there. The views are nice from pretty much everywhere. ACCESS: Roads to and in the campground are paved. Turn off Route 54 and head east about 4 miles to the campground. MAXIMUM RIG SIZE: I’d check with the office. The sites I saw weren’t the largest but there were some pretty good size rigs here. LEVELNESS: This campground sits on an alluvial fan which has slope. Many if not most of the sites are rather tilty. Of the reservation sites 2-4 may be the best. 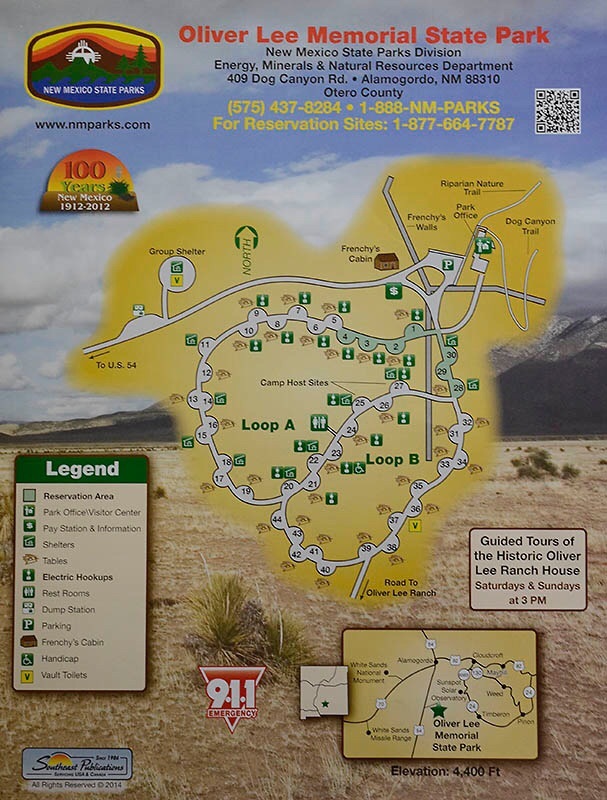 Here’s a shot of the map they hand out at the campground office of Oliver Lee Memorial Park. Loop A and the road between it and Loop B have all of the sites with electricity. Note the legend as to which they are. The sites shown in green are the reservable sites. There is some useful info on the map if you look. Most of the sites are pretty tilty. At first I was in 5 and could not get level. Then I moved to 8 where it was not a problem. Note: With my AT&T iPhone 5s cell service was intermittent, with and without my cell booster. It vacillated from No Service to 5 bars with 4G, back and forth on a moment-to-moment basis. Sometimes I had no data connection while at other times I did, with and without the booster. Cellular connectivity with my AT&T iPhone at this location was perhaps the most erratic I’ve ever encountered. The numbers provided below should be taken loosely, knowing that readings varied. Over-the-air: Yes. Scanning for stations my TV located about 40. SHOWER RATING: Fail (I evaluate showers in a similar fashion to restrooms. See above.) Men’s showers have those push buttons that turn themselves off. One shower shut itself off almost immediately making it unusable, unless you had 3 hands. The other, the handicap shower, was very cramped and awkward to use. It also had a slippery floor. If you weren’t disabled going in you might be disabled before you leave. The button had to be pressed every 40 seconds to keep the water flowing. Water temperature cannot be adjusted and it may not be hot enough to shower. The state of New Mexico should be embarrassed by the conditions here. Groceries: There’s a Loves supermarket and a Walmart with some groceries in Alamogordo. Oliver Lee General Store just outside the campground but I don’t know what food they have, if any. Perhaps the park personnel know. 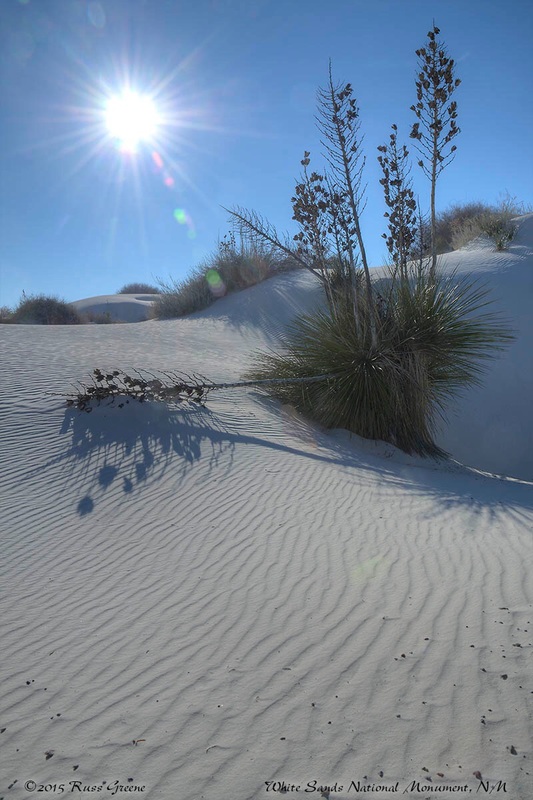 Oliver Lee Memorial Park Campground–phew, that’s a mouthful–is a good jumping off point to visit White Sands National Monument. 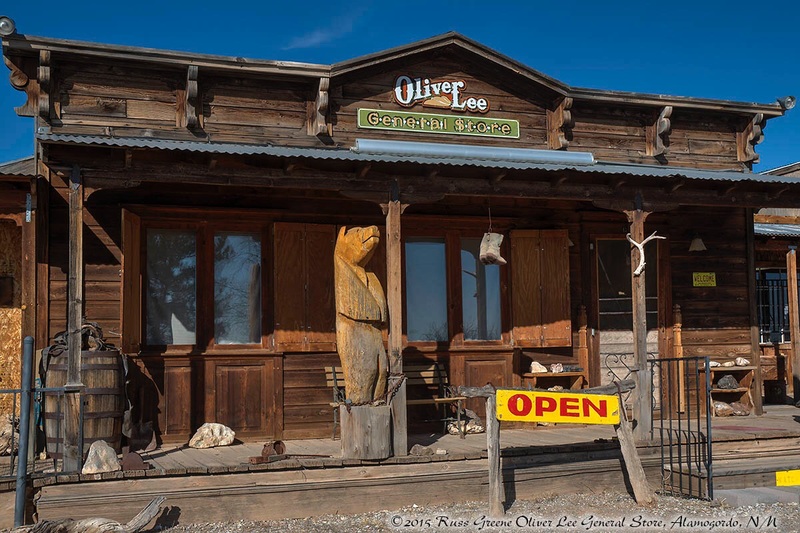 There are a few priavte campgrounds closer to White Sands but not with the remote feel or low price of Oliver Lee. 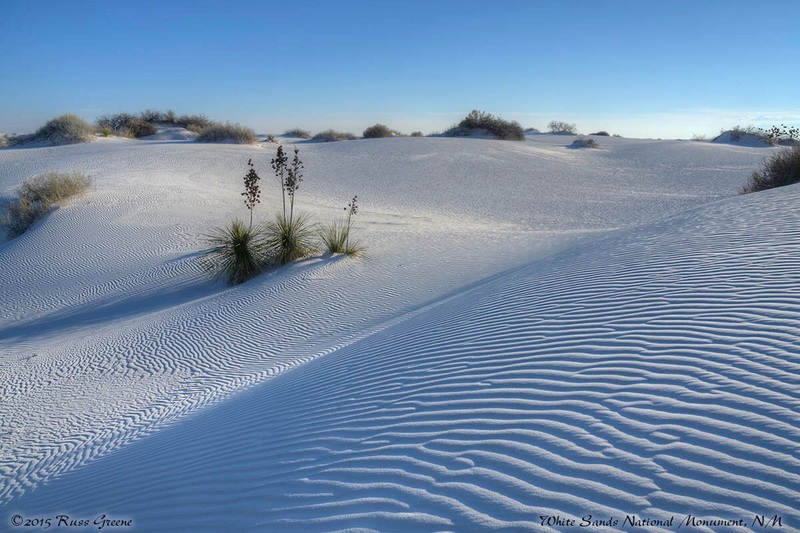 White Sands is a place I’ve wanted to visit in order to photograph for some time. White Sands, by the way, is sometimes closed due to missile testing at the nearby missle test range. 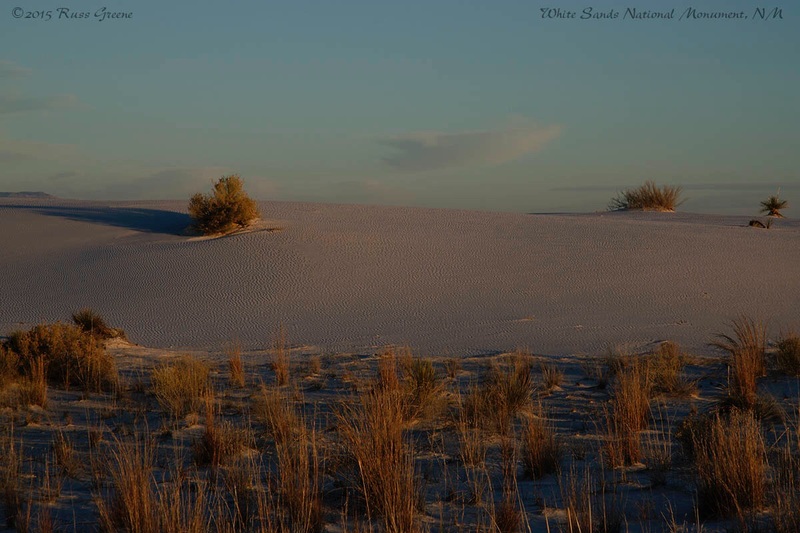 Call White Sands to check the schedule 575-479-6124. The campground is on the small side with just 30 spaces and roughly half have hookups (see above). Sitting on an alluvial plain the campground on its slope, many of the sites are not nearly level. In fact, I could not get level in #5 and moved to #8 as soon as it opened up. When I arrived #5 was the only site with water and electricity that was available. It can be hard to get such a site here. Only seven sites are reservable of the 44 in the park and with the reservation fee at $12 it costs almost as much as $14 camp site. About 16 miles to the north is Alamogordo. A town that exists largely to support the nearby Holloman Air Force Base. There you can probably find pretty much anything you need. The fact Walmart has opened a store in town is an indication of significant surrounding population. 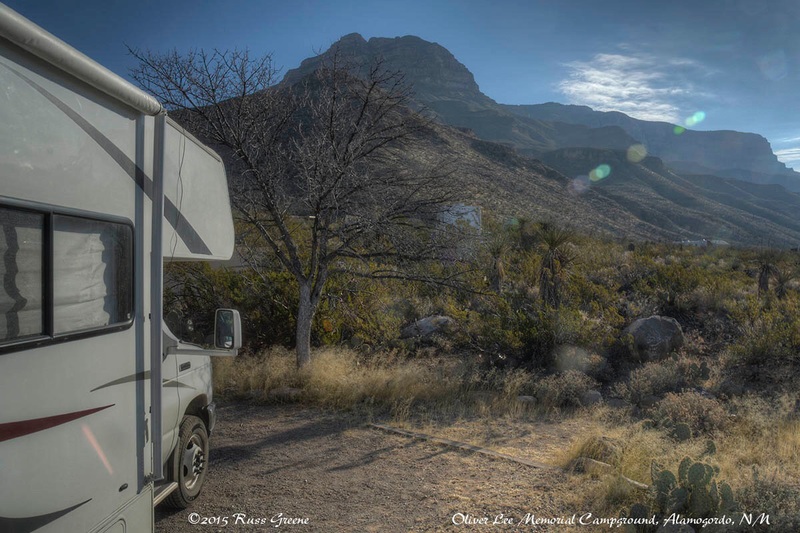 Oliver Lee Memorial Park Campground is in the desert. Winter is the bay season I take it. It gets real hot in the summer. It can also be cold. It was near 30º last night, in mid January. Free guided tours of the nearby Oliver Lee residence are available via a ranger in the park office. 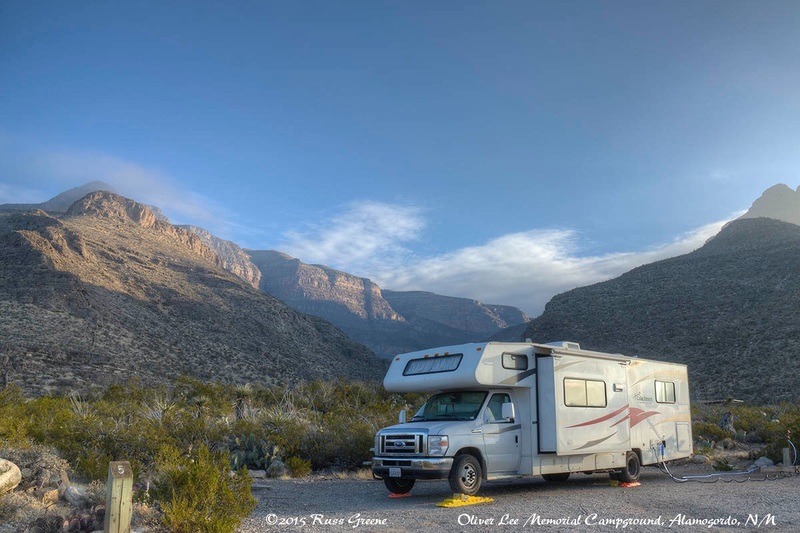 I chose to stay here for a few days on my way from Texas to Quartzsite, AZ because, as I wrote above it was near White Sands, plus it had hookups and I really like electricity when it’s cold out. There aren’t a lot of camping options in these parts and I had friends camping here–two more reasons I chose to camp here. 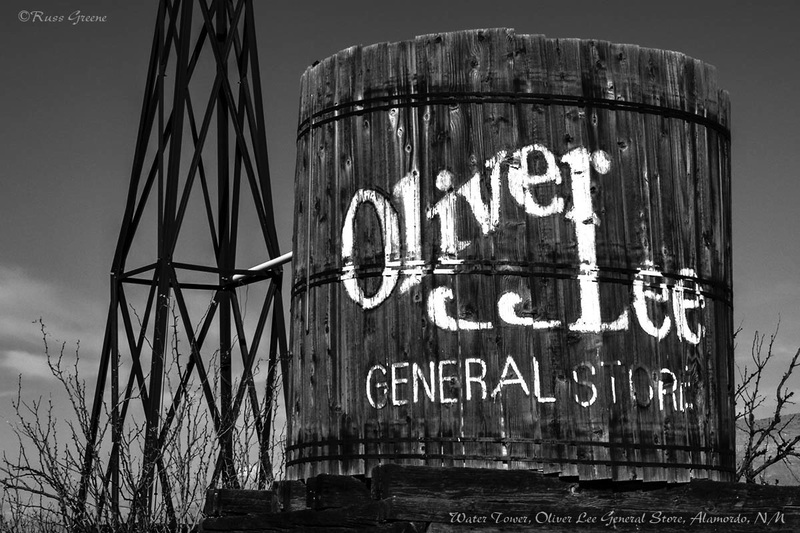 Oliver Lee General Store is just outside Oliver Lee Memorial Campground. It’s very rustic and picturesque. I can’t advise you on what they carry in stock as I didn’t go inside. Views of the nearby mountains are nice. A hiking trail or two lead out of the campground up into them. On the other side there are views of the flats. The campground is quiet. Highway 54 is about 4 miles away and is the nearest road of which I’m aware that carries any real traffic. Yes, please let me know how we can do this “enlargement” from far away and on line, and let me know the cost please. I would love it! I’ll send you a private email about this. As you come into town from the south, there is a good Chinese buffet on the west side of the road next to Dennys. If you go up to tenth street and turn towards the mountains you will find grocery stores. DW and I are planning on a weekend here sometime this spring, just to get out of town. Thanks for contributing that info to the blog. It is fun to meet up with friends on the road especially since it has not been all that common. I suppose it’s likely to happen more and more the longer I’m out here and the more friends I make. I met Tim and Issy back in Little Rock. Out travel trajectories have been similar and I’ve seen them about a half a dozen times since we first met a few months ago. If you decide you really would like a White Sands enlargement let me know. It’s not too difficult to arrange for that in today’s online world. Of course there would be costs to arrange it all. Love the photo from the ‘off limits’ area. Wish we had spent more time at White Sands but the winds were brutal during most of our stay at Oliver Lee. We got lucky with the weather when we were at the dunes. Wind was light and there was sun. Thanks for you kind words about my photography!